Convertible two-position seater/sleeper is the am/pm solution for the space-challenged or the friendly out-of-towner. By day, it's an upright comfy sofa for TV/reading. When shut-eye rolls around, the back flips all the way down into a worthy bed. 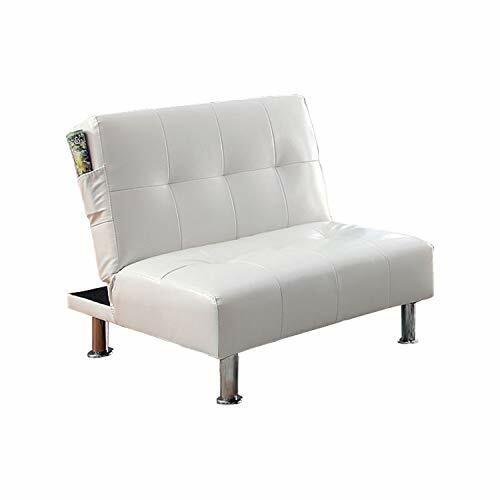 Our convertible sofa features convenient side pockets to store remotes and are tailored in multiple colors and textured: Gray Leatherette, Red Leatherette, White Leatherette, Black Leatherette and Camouflage Fabric. Product internal frame is made of selected solid woods material. Assembly Required. Product measures 70 by 34 by 36 Inch; Flat measures 70 by 15 by 45.5 inches; Seat height: 15.75 inches; Seat depth: 22 inches. All decor items are not included in this offer unless specified. 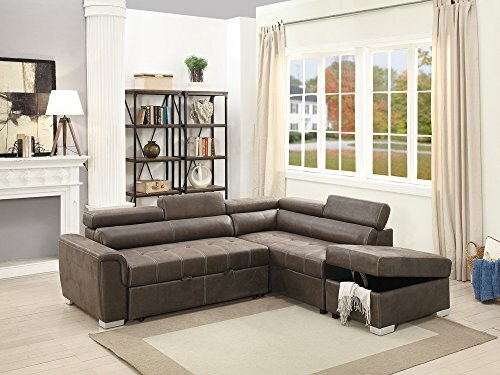 Featuring great comfort and sleek style for lounging or hosting overnight guests, Ethel Leatherette convertible sofa is a space-saving convertible sofa that easily transforms your room into a versatile space. By day it's an upright comfy sofa for TV/reading. Shut-eye rolls around, the back flips all the way down into a worthy bed. Our convertible sofa comes with a matching chair that can transition into an ottoman. Situate the ottoman to any sides of the futon edge for extended leg room when lounging. Product internal frame is made of selected solid woods material. Assembly Required. Futon Measures 71 by 35 by 34 Inch; Chair Measures 37 by 37.50 by 36 Inch. All decor items are not included in this offer unless specified. Utility and comfort come together in this highly functional leatherette chair. Folding the back down, the chair connects with the matching futon to create a comfortable chaise. Add a touch of style to your décor with this elegantly designed furniture. This furniture is designed with the vision of providing comfort in your setting while raising the style quotient. Epitomizes the idea of bringing exceptional value with distinctive furniture for your home. This stylish convertible sectional sofa goes for a simple yet elegant modern look in your living room. This modern leatherette sofa with contemporary detailed stitching conveniently doubles as a bed for unexpected guests. The unique design inspires a fresh look for your home. Sectional designed with maximum comfort in mind. Frames are made of durable tropical wood. This furniture features a sectional sofa that can easily converted into bed position. This sectional comprises 1 chaise, 1 pull out bed, and 1 storage ottoman. Some assembly required. 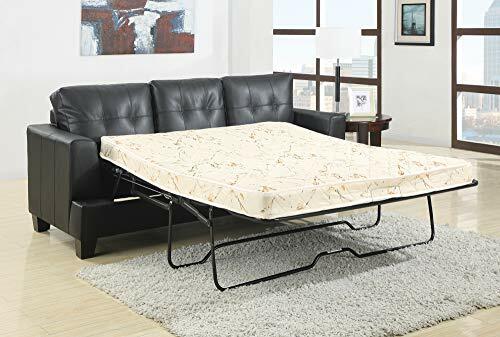 Chaise: 61" x 35" x 29-33"H Pull-out bed: 62" x 35" x 29-33"H Ottoman: 34" x 22" x 18"H Material: Breathable Leatherette Color:Dark coffee Plywood base panel with solid pine frame.Metal legs, adjustable headrests, Pocket coil seat cushion with foam encasement. 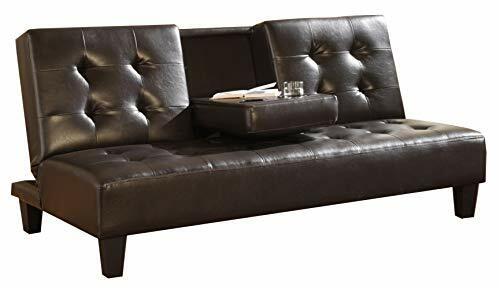 This futon sofa bed features tufted designed along with drop down cup holder and tapered feet providing it a good support. It is sure to uplift the beauty of your living space by providing great comfort for lounging and relaxing. The sofa has wooden framing and has Black leather upholstered, tufted microfiber. 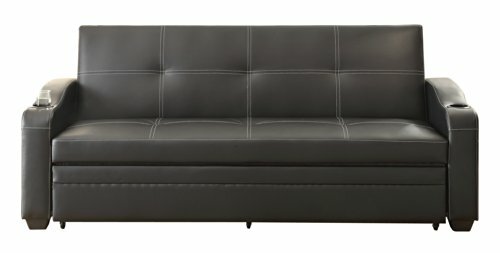 This sleek faux leather upholstered sofa converts into a twin bed. The multi-functional Marcelo Collection will provide your home with the seating and sleep space you require. When the click mechanism sofa is adjusted to a fully reclined position, it is met with the pullout trundle that extends this multi-functional sofa into a bed. Other features include cup holders and the black bi-cast vinyl with white contrast stitching cover. This stylish convertible sectional sofa goes for a simple yet elegant modern look in your living room. This modern leatherette sofa with contemporary detailed stitching conveniently doubles as a bed for unexpected guests. The unique design inspires a fresh look for your home. Sectional designed with maximum comfort in mind. Frames are made of durable tropical wood. This furniture features a sectional sofa that can easily converted into bed position. This sectional comprises 1 chaise, 1 pull out bed, and 1 storage ottoman. Some assembly required. 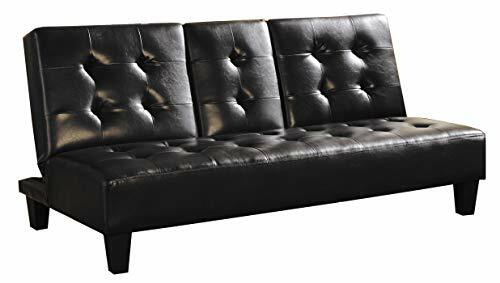 Chaise: 61" x 35" x 29-33"HPull-out bed: 62" x 35" x 29-33"HOttoman: 34" x 22" x 18"H Material: Breathable Leatherette color: Dark coffee Plywood base panel with solid pine frame. Metal legs, adjustable headrests, Pocket coil seat cushion with foam encasement. A well cushioned seat and back finished in a black Colored bonded leather. This sleeper incorporates a hidden pull-out bed in the chaise. This sleeper sports track armrests on either side for your elbows to relax onto. Place it in your bedroom or your living area, this sleeper makes for the perfect piece of furniture for your humble abode. 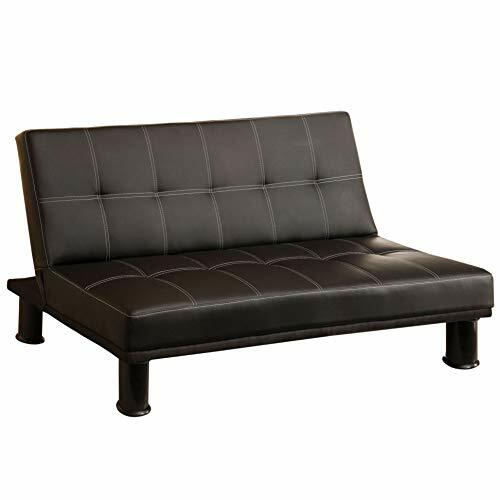 This futon sofa bed features tufted designed along with drop down cup holder and tapered feet providing it a good support. It is sure to uplift the beauty of your living space by providing great comfort for lounging and relaxing. 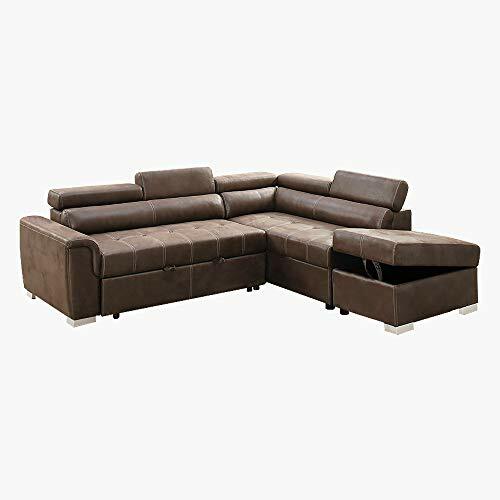 The sofa has wooden framing and has an espresso brown leather upholstered, tufted microfiber. 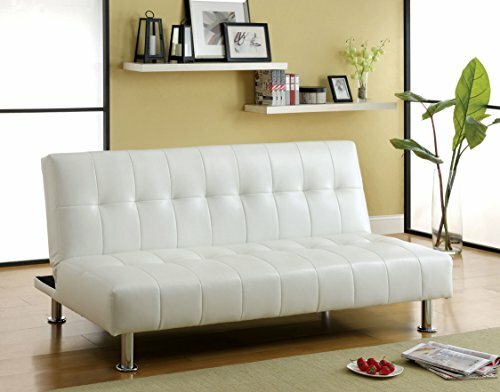 This sleek faux leather upholstered sofa converts into a twin bed. This Benzara sofa us the one for you. http://bit.ly/1OmaOPV ^Shop the Memoky Sleeper Sofa Collection! Many Options Available! 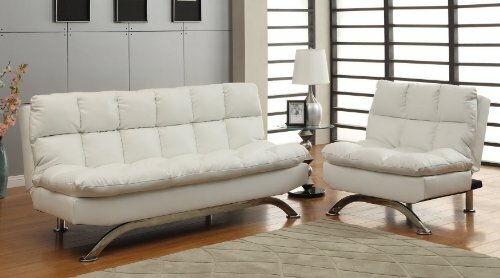 Compare prices on Leatherette Convertible Sofa at Elevelist.com – use promo codes and coupons for best offers and deals. We work hard to get you amazing deals and collect all avail hot offers online and represent it in one place for the customers. Now our visitors can leverage benefits of big brands and heavy discounts available for that day and for famous brands.